Janet Samber eloquently described this author whose life’s work, like that of Aleksandr Solzhenitsyn, was dedicated to letting the world really understand what living under a repressive regime really was. All the while their books were being read abroad and helping instigate change, they were banned in their respective countries. Both authors stayed true to their cultural roots, remaining in their countries at cost and peril to their lives. Her themes of injustice and of the cruelty of South Africa’s policy of apartheid, with its attendant expressive racist and censorship policies resonated to a world audience, as she was lauded and awarded prizes including the Booker Prize for The Conservationist, 1974, and her crowning achievement, the Nobel Prize for Literature, 1991. While her achievements were recognized by the outside world, her books were being banned at home. 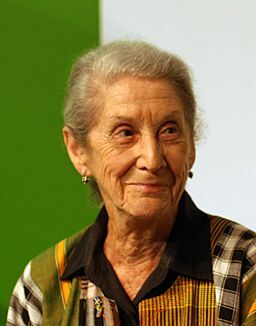 Gordimer stated, “I am not a political person by nature. I don’t suppose if I had lived elsewhere, my writing would have reflected politics much, if at all.” However, live in South Africa she did and as a result, Gordimer has left a legacy of a huge body of work, 15 novels, 20 short story collections, 5 essay collections, and a collection of one act plays that give powerful and unsentimental witness to life during a repressive regime and to the problems encountered during post-apartheid times.